Mitchell Wick was born on July 6, 1986. He is an Australian model, currently residing in Sydney, Australia. Mitchell's modelling career began in August 2014 when he was spotted at a Miami music festival by an American talent scout. Today Mitchell's name is recognised on the world modelling stage, within the industry and among the top male models world-wide. He's also growing a small empire of loyal fans who follow his daily behind-the-scenes social media exclusives. His most recent success has seen him starring on the cover of popular American magazine titles Desnudo and HUF magazine. International Model & DJ from Sydney Mitchell enjoys being being active & outdoor whenever he can. His favourite things in life are surfing, hiking, football (soccer), travelling, music & spending time with his family. Casually standing in the shuttle line out the front of Ultra Music Festival in Miami after a rather large week Mitchell was approached by a scout for a top modelling agency. At the time he thought it was a joke and a poor attempt at a pick-up with all the compliments getting thrown around, but obviously he was wrong and the rest is history. 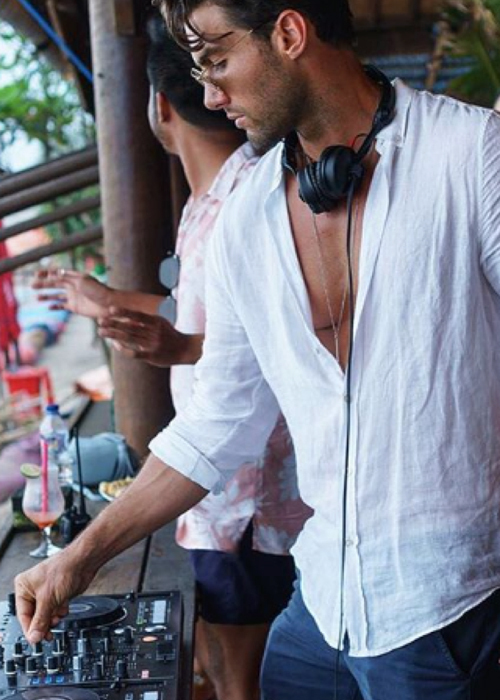 Since being spotted at the music festival, Mitchell Wick’s career has skyrocketed as an internationally known model, working all over the world, travelling from one exotic shoot to another, and picking up more and more fans on his action-filled Instagram account along the way, making him one of Australia’s most followed influencers. Recently shot an ad with Lindsay Lohan for L’Officiel Russia, definitely a memorable one for numerous reasons! Armani, D&G, Balmain and many other men’s labels which I would love to get a campaign. When I’m DJing I play a lot of recognisable vocals that people can sing along to and dance to but switch it up with little known remixes & mashups to keep it interesting. Something my father would always tell me – “If you’re not going to do it 100% then don’t do it at all”, and thats how I try to live everyday. Please contact Mitchell Wick via email LINK for bookings and further information.